Manners At The Dinner Table… a lost art? and Grace was on her new Itouch. They were happily enjoying all the super technology they got for Christmas. It is abundantly clear they love their technological devices. Don’t get me wrong, I am a huge fan of technology and progress. I myself love my MacBook, my Blackberry and my Itouch. However sitting there it felt as if I was having an outer body experience. I was looking at this family with these three children not interacting at all with each other or their parents. Durning dinner I didn’t tell anyone to put their technological devices away, I just observed. Later on that night the image really began to eat away at me. What had we become? We were like a bad cliche from a tv sitcom. I was never going to have children who behaved this way. My children were going to perfect with wonderful table manners. My dream had always been we would all sit around the dining room table and have wonderful family meals where we would share amusing stories about our day- I watched a lot of Family Ties growing up. I began to realize my dream of perfect dinner hours were being shattered. Instead of sitting around like the Keatons we were in danger of not communicating at all. I see more of the top of my pre-teen’s head then I do her face. Her head is constantly at a tilt. 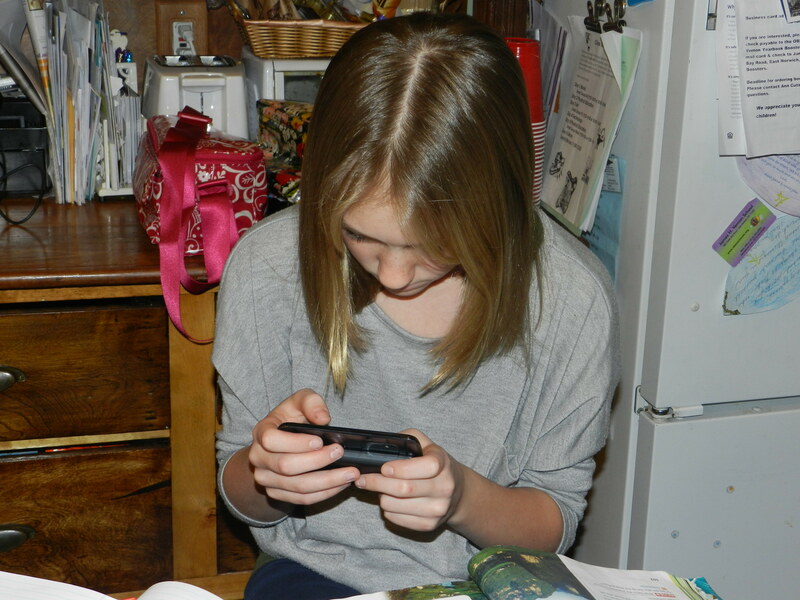 New data reported from Nielsen shows that teenagers ages 13-17 average 3,417 texts a month. Teen girls are reported to text a whopping 3,952 times a month. That is more than 130 texts a day. This generation is going to suffer with severe neck problems in their 40’s and 50’s. I realize that texting is communication. I firmly believe that social networking and texting have value. These skills are valuable and they will need them when they eventually enter the workforce. I am not interested in stopping progress. I get it. I know we need to forge ahead in technology. But what is the cost? Is the family dinner hour being sacrificied to the gods of constant communication? I think we are paying too high a price. Who is to blame? I can’t entirely blame Caroline or her new phone. Who gave her these devices in the first place? Who is she learning this behavior from? As I pondered these thoughts the answer came to me and made my stomach turn. Unfortunately, I know the most important rule of of raising children is they learn by example. I began to wonder am I the culprit? What am I doing to send the message that this behavior is okay? I think we all know the answer. I don’t even want to know how many texts I send a day. I am coming to terms with the fact that my family will never be the Keatons. Life has changed and we are just too busy. Quick meals, to go meals and restaurants make up most of my dinner hours. Especially with both parents working and all of the activities the kids are involved in. But that does not mean we need to sacrifice the family meal or manners. We can still teach our kids to enjoy the company of those they are with along with some basic table manners: sit with your feet under the table, sit upright in your chair, chew with mouth closed, and of course my father’s favorite no elbows on the table. The following morning after three dance classes we decided to go out to breakfast- we really do eat out too much! As we sat down I took my cell phone and put it in my pocketbook and invited the girls to do the same. Begrudingly they agreed, and we enjoyed our first technology free meal. 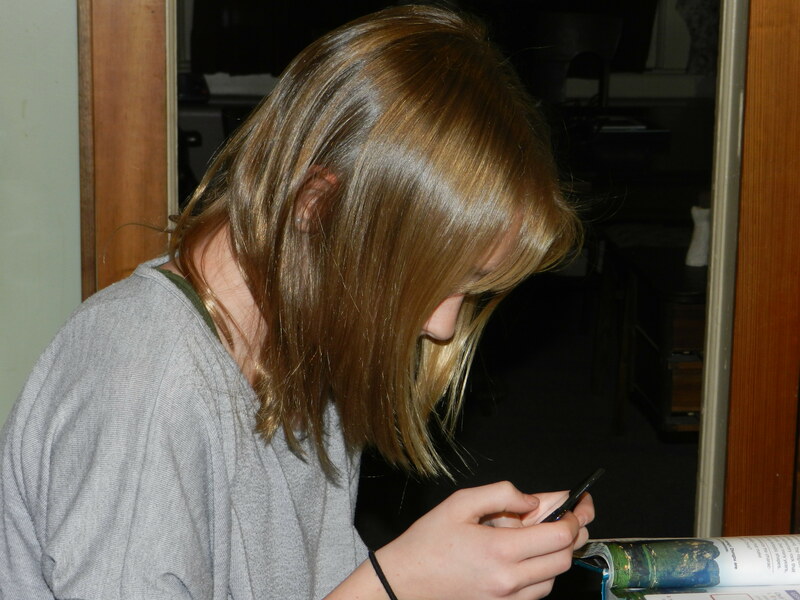 This entry was posted in Motherhood and tagged Emily Post, Family Ties, manners, manners at the table, no texting at the table, table manners, teenagers texting, texting, texting at the table. Bookmark the permalink. 6 Responses to Manners At The Dinner Table… a lost art? We watched together and tried to answer the questions, also leading to some discussions. But, back to the point, the no tech table was one of the best things we ever did- at home or in a restaurant- eye to eye conversations, manner reminders, and , naturally, referring the sibling friction that occasionally rears its ugly head. But that is probably another thread! First off great blog cousin! My best to you. I’ve read most of the categories and there all important, very funny & very real, however this very topic interestingly enough I had just spoke with your Aunt Mary about on New Years Day…. hmmm coincidence? Just kidding. Anyway I couldn’t agree more whille technology is a beautiful thing there is a time and a place for it, and that’s coming from someone who considers himself Mr. Tech… This is a tough one and my hat off to any family or couple who can pull dinner off without even the TV which I trully love. What did I ever do before without my DVR? Anyway I trully believe from my own parents core values instilled in me that dinner should be a time reserved for possible sharing, interacting, and listening to eachother. A time to connect on the simplest level, a good old fashion conversation. At least once a week is a goal for my own family. This is not only a problem I find for many families, but many couples as well. I think it has to start there because if you and your significant other do not take time to connect between the two of you, then one day as parents you may not make it a priority for your children to do so. Again I’m not one to judge as I have been guilty of texting things like “Luv u babe” or “missed you today” as I putt around outside the house when she’s sitting ten feet away inside. I understand no couple or family can compete with the “Cleavers” (a 1950’s “feel good” corny family show for you young folk) but I feel the need to at least try for that 20 or so minutes to put the phone,laptop, or IPad down, shut off the TV and RE-CONNECT. Look eachother in the eyes and listen, hopefully laugh and ultimately love. DP you are the greatest. Thank you so much for remembering to check out my site. I am glad you got some laughs! You are right all the way. As life moves on and new things are introduced it poses challenges and changes for society and family. It is a great testament to people that we can adapt and change as times move on. I always feel that is the reason Grandma is so happy and has lived so long. (Our grandmother is 93) It is because she has lived through so much and always adapted to changes. If you can’t adapt life is hard. Although I don’t necessarily go for the Cleavers- I am more of an 80’s sitcom gal. Family Ties and Growing Pains are more my style. But I would like to have Mrs. Cleavers great vintage dresses and pearls! I know exactly what you mean. We need to always make time for those who matter- like great cousins. Good luck to you and your family. You guys are a great couple!! Make sure you always take time for each other! It seems like so many families have made similar technology rules in their own homes. It comforts me to know that people are concerned about family and preserving family time. And watching Jeopardy in honor of Grandpa is a great way to honor and remember him, even during the dinner hour. It is great to look in the mirror and see ourselves. Even though sometimes it is hard and you might not like who you see. You have to be able to recognize and make changes if the reflection is not what you were expecting. Thanks so much for all the support and for always checking out my posts. Good for you for setting an example. I’ve attended friends’ children’s birthday parties and been grieved to see the behavior of family members (adult and teen) who are supposed to be there to celebrate the birthday child. But instead, they spend much of the party texting other people. When you’re at dinner, or at a party, communicate with the people there. Enjoy the people around you. Ignoring others just so you can text somebody else is rude. It is crazy how many people ignore others and text or look up emails on their phone. When adults do it, it is really appalling. When did the message on a text become more important than the people you are with? Instant communication is great but this behavior is a poor societal trend. Hopefully enough people like you will help turn the tide. Thanks for reading.